At the age of eight, I became a reactionary fan of great Mohammed Rafi Sahab with this great romantic song from the 1966 film “SURAJ” which was very perfectly picturised on Rajendra Kumar showering with flowers to Vyjayanthimala in a natural location with Elephant and Peacock. The film was produced by S. Krishnamurthy & directed by T. Prakash Rao which considered one of the first highly commercially successful fantasy dramas of Hindi Cinema. Shanker-Jaikishen’s chartbuster music and Mohammed Rafi’s singing played an important role in the film’s popularity. The film showed Rajendra Kumar as a blustering hero with swords, horses, elephant, etc. and the songs of the film are remembered till date considering all time evergreen hits. Mohammed Rafi: Filmfare Best Male Playback Award for singing “Baharon Phool Barsao”. 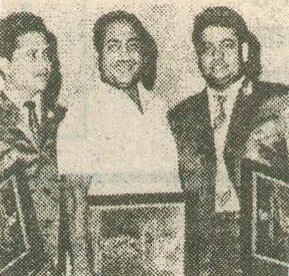 Shankar Jaikishan : Filmfare Best Music Director Award. Hasrat Jaipuri : Filmfare Best Lyricist Award writing “Baharon Phool Barsao”. Sharda : Special Filmfare Award for her first song “’Titli Udi”. In the early 1980s, Rajendra Kumar films like SURAJ, GANWAR, GORA AUR KALA, etc. were screened in the 1st & 2nd show with hit Assamese films like “AAJALI NABOU”, “KAKA DEUTA NATI AARU HATI”, “JEEVAN SURAVI”, etc. after completion of 3rd or 4th week in the Rupalim Cinema, Sivasagar. My father advised us to complete our studies in afternoon, allowed & accompanied us for 1st or 2nd show to view old films in Saturdays or Sundays. In my class IV, I had seen the film SURAJ and became a fan of Mohammed Rafi & Rajendra Kumar. Suraj is the second memorable film of my childhood after SHOLAY. I am an all time fan of Amitabh Bachchan, since I was born & brought-up in the era of “angry young man”. Rafi Saheb also had a high regard for the actor and he was very cheerful when he sung with the actor in the song, “Chal Mere Bhai” from NASEEB. I also became great fan of evergreen Dev Anand & zany Shammi Kapoor after popularity of Television in late 1980s viewing Old films, Rangoli & Chitrahar, since some enormous number of Rafi gems were well picturised on the both legendary actors. In 1960s, the Rajendra Kumar films were unsurpassed for bordering of super duper hit romantic Rafi gems picturised in beautiful and natural locations of Kashmir and Himachal with musical scores mainly by Shankar-Jaikishan. Rafi Saheb was the natural voice of Rajendra Kumar and catch of Rafi songs supported to a great extent making Kumar’s six consecutive films hits between 1963 to 1966: Mere Mehboob(1963),Sangam(1964), Ayee Milan Ki Bela(1964),Zindegi(1964),Arzoo(1965) and Suraj(1966), which felicitated him the label of “Jubilee Hero”. He was also called “carbon copy” of tragedy king, Dilip Kumar for his well playing the misfortune & sacrificing roles. 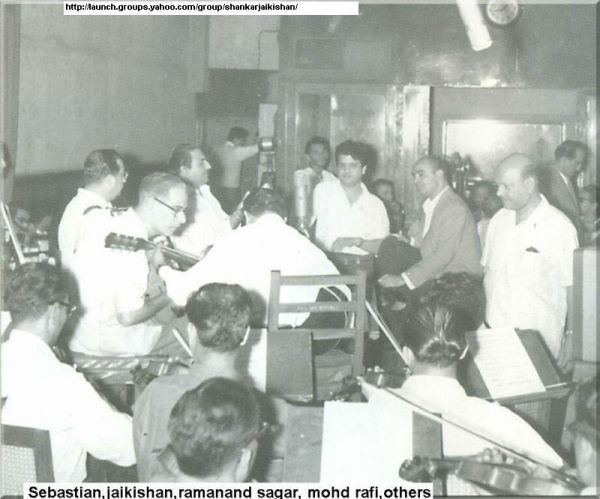 Shankar-Jaikishan penned music for almost all hit films of Rajendra Kumar with golden voice of Mohd. Rafi Saheb. The notable films of this combination are: AAS KA PANCHI, SASURAL, DIL EK MANDIR, HUMRAHI, AYEE MILAN KI BELA, SANGAM, ZINDAGI, ARZOO, SURAJ, AMAN, JHUK GAYA AASMAN, SHATRAJ, DHARTI, etc. The combination of SJ-Rafi-RK started with the film Aas Ka Panchi where title song of the film, “Dil Mera Ek Aas Ka Panchhi” sung by Subir Sen and other songs sung by Mukesh for Rajendra Kumar. The only song from the film, “Aab Chaar Dinon Ki Chhutti Hai” sung by Rafi Sahab & Chorus. The southern family drama, Sasural starring Rajendra Kumar and B. Sharoja Devi was the first big hit of this combination. The Rafi solos from the film, “Teri Pyari Pyari Surat Ko Kisi Ki Nazar Na Lage”, “Ae Nargise Mastana”, “Yeh Albela Tarna Dekha, Tumsa Koi Aur Na Dekha” are always eternal and the duets, “Ek Sawal Main Karo, Ek Sawal Tum Karo” & “Kya Mil Gaya Aur Kiya Kho Gaya” are also popular. Dil Ek Mandir is a landmark film of this combination, the title song of the film sung by Rafi & Suman Kalyanpur. The romantic solo, “Yahan Koyee Nahin Tere Mere Siba, Tum Sab Ko Chhod Kar Aajaoo” & the emotional solo, “Yaad Na Jaye Bite Dinoo Ki” were superbly sung by Rafi Sahab for Rajendra Kumar. Humrahi is a musical hit of this combination starring Rajendra Kumar and Jamuna. The Rafi solos from the film, “Main Albela Jawan Hoon Rangila”, “Yeh Ansoo Mere Dil Ki Zubani Hai”, “Woh Chale Jhatake Ke Daman” & “Dil Tu Bhi Gaa” were huge beats. The duets, “Woh Din Yaad Karo” & “Karke Jiska Intezar” by Rafi-Lata and “Mujhko Apne Gale Lagalo” by Rafi-Mubarak Begum were also well-liked. The film, Aayee Milan Ki Bela begins with Rafi gem, “Main Pyar Ka Deewana” picturised on Rajendra Kumar in a beautiful location. The title song of the film and other solos, “Tum Kamsin Ho, Nadan Ho”, “Tumko Hamari Umar Lag”, “Bura Man Gaye” well sung by Rafi Sahab. The only Rafi solo from Sangam, “Yeh Mera Prem Patra Pahkar, Tum Naraz Na Hona” is one of the best romantic song ever sung by Rafi Saheb for Rajendra Kumar. The Zindegi solo, “Humne Bafa Na Shekhi, Unko Zafa Na Aayee” is very affective singing by Rafi Sahab for love lost Rajendra Kumar. The Rafi solos from Arzoo, “Ai Phoolon Ki Rani, Baharon Ki Malka”, “Ai Nargise Mastana”, “Aji Ruth Kar Ab Kahan Jaiyega” are everlasting romantic songs of HFM. The Rafi ghazal from the film, “Chhalke Teri Ankhon Se Sharab Aur Jiyada” was well picturised on Rajendra Kumar. The Rafi solos from Suraj, “Baharon Phool Barsao” & “Chehre Pe Girin Zulfen” were hugely popular and other two duets, “Kitna Hai Tumse Pyar Mujhe Mere Rajedar” with Suman Kalyanpur & “Kaise Samjhaoon Badi Na Samaj Ho” with Asha Bhosle are also considered as all time romantic hits. The romantic number from Aman, “Yeh Aaj Ki Raat Kaise Raat, Mujko Need Na Aayee” is a adoring song picturised on Rajendra Kumar & Saira Banu. The film, Jhuk Gaya Aaasman is an all time musical hit and the Rafi solos from the film, “Kahan Chal Diye, Idhar Tu Aayoo”, “Kaun Hai Jo Sapnon Mein Aaya” & “Sacha Hai Gar Pyar Mera Sanam” are unending romantic hits. The spy drama film, Shatraj begins with the title song, “Shatranj Ki Chal Hai Hamari” sung by Rafi Sahab playing in background. The other duets of the film, “Tumhen Agar Main Apna Saathi” & “Samjho Zara Kahti Hai” were sung by Raf & Asha Bhosle. Dharti is the last film of this combination and the songs of the film are quite popular. The Rafi solos, “Khuda Bhi Aasman Se Dekhta Hoga”, “Jab Se Aankhen Ho Gayi Tumse Saar Ish Dharti Par” and duets with Lata, “Yeh Mausam Bheega Bheega Hai’, “Yeh Albeli Pyar Ki Raahen” were beautifully picturised on Rajendra Kumar & Waheeda Rahman. Naushad Saheb also composed music for Rajendra Kumar starred films like: Mere Mehboob, Palki, Saathi, Ganwaar, Tengewala and Sunehra Sansar, out of which Mere Mehboob and Ganwaar were the box office hits with Rafi gems. H.S. Rawail’s triangular romantic and muslim social drama had popular Rafi songs: “Ai Husn Zara Jaag Tujhe Isqe Jagati Hai”, “Mere Mehboob Tujhe Meri Mohabbat Ki Kasam Phir Mujhe Nargisi Aakhon Ka Sahara De De”, “Tumse Izhaar-e-Haal Kar Baithe”, “Aaj Purkat Ka Khwab Tut Gaya”, “Yaad Mein Teri Jag-Jag Ke Hum Raat Bhar Karwate Badalte Hai” in ghazal forms. Mahesh Kaul’s Palki had also similar Rafi ghazals like “Aye Shehr-e-Lakhnoo Tujhe Mera Salaam Hai”, “Dil-e-Betaab Ko Seene Se Lagaana Hoga”, “Mere Ghar Se Pyaar Ki Palki Chali Gayee”, “Kaal Raat Zindegi Se Mulakat Ho Gaye Lab Tharthara Rahe The Magar Baat Ho Gaye”, “Bhari Mehfil Mein Agar Mere Maula Ek Tera Sahara Mil Jaaye”. Mukesh and Lata sang the memorable song from Sridhar’s Saathi “Mera Pyar Bhi Tu Hai Ai Bahar Bhi Tu Hai Tuhi Nazroon Mein Jane Tamanna”. Rajendra Kumar’s home production Ganwaar with his real life brother Naresh Kumar in director’s seat had number of popular and memorable songs: “Duniya Hanse Hanste Rahe Main Hoon Ganwaar Mujhe Saab Se He Pyar”, “Mehka Mehka Roop Tuhmara Beheki Beheki Chal Main Pholoon Ki Daal Girahi Pooche Ek Sawal Tuhmara Naam Kya Hai” and the Sharabi number “Peekar Sharab Khelunga Main Tu Sabab Se Bathe Hai Mere Samne Chehere Gulab Se” by Rafi, “Hum Se To Achhi Teri Payal Gori Jo Rooj Rooj Tera Badan Sumee” and “Tera Chikna Roop Hai Aaicha Anar Jaisa Kajra Laal Sajini” by Rafi-Asha. Mahendra Kapoor sang another song from the film “Woh Kaun Hai Jo Maaki Tarah Booj Uthayee Palkoo Mein Bethayee, Yehi Dharti Yehi Dharti”. It was the last box office success of Rajendra Kumar and also the last film of Vyjayanthimala who paired with him in six films. Ravi composed memorable music for Rajendra Kumar’s debut film, Vachann and other films like Ghar Sansar, Chirag Kahan Roshni Kahan, Gharana, Pyar Ka Sagar, Gehra Daag, etc. The romantic Rafi solos from Gharana, “Husnuwale Tera Jawab Nahin” and “Jab Se Tumhe Dekha Hai” picturised on Jubilee Kumar & Asha Parekh was so memorable. The Rafi numbers from Pyar Ka Sagar starring Rajendra Kumar & Meena Kumari, “Mujhe Pyar Ki Zindegi Denewali” and “Sada Khush Rahe Tu Zafa Karnewali” & from Gehra Daag starring Rajendra Kumar & Mala Sinha, “Aaj Udta Hua Ek Panchi, Zindegi Ki Baharon Mein Aaya” & “Tuhme Pake Maine Jahan Pa Liya Hai” were so soulful. Ramanand Sagar’s GEET and LALKAAR were the notable films of this combination. The title song of Geet, “Mere Mitwa Mere Meet Re, Aaja Tujko Pukare Mere Geet Re” one solo by Rafi and another duet by Rafi-Lata was so hunting and popular till date. The romantic Rafi-Lata duet from Lalkar, “Bol Mere Saathiya Kitna Mujhse Pyar Hai” was picturised on Rajendra Kumar & Mala Sinha. Mohan Kumar’s ANJANA & AAP AYE BAHAR AAYE and Naresh Kumar’s GORA AUR KALA were the notable films of this combination. Anjana had “Meri Mohbaat Teri Jawani”, “Main Rahi Anjaan Rahoon Ka”, “Jaan Chali Jaye Jiya Nahin Jaye” solos by Rafi and the Rafi-Lata duet “Rim Jhim Ke Geet Sawaan Gaye” which is one of the best rain songs of Hindi Film Music. The title song of the Aap Aye Bahaar Ayee was one the best romantic solo of Rafi Saheb picturised on Rajendra Kumar. The other songs of the film, the solo, “Poochhe Jo Koi Mujh Se Bahar Kaisee Hota Hai”, by Rafi and duets, “Mujhe Teri Mohabbat Ka, Sahara Mil Gaya Hota”, “Koyal Kyun Gaye”, by Rafi-Lata were picturised on Rajendra Kumar & Sadhana. The duet by Rafi, Hemlata & Chorus, “Taare Kitne Neel Gagan Pe Taare” is a well known children song from the film. Unfortunately, in another duet from the film, “Tum Ko Bhi Tu, Aaisa Hi Kuch Hota Hoga Wo Sajini”, Kishore Kumar became the voice of Rafi hero Rajendra Kumar. Gora Aur Kala had the romantic number “Tu Mere Sapon Ki Rani Banegi”, the sharabi number “Tere Nain Nashe Ke Pyale” by Rafi. The title song of the film “Dhoom Mach Gayi Dhoom” was sung by Rafi, Usha Mangeskar & Chorus. Another popular song of the film “Dheere Dheere Bol Koi Sun Na Le” was sung by Mukesh & Lata Mangeshkar. S.D. Burman composed music for O.P. Ralhan’s Talash starring Rajendra Kumar and Sharmila Tagore and the Rafi-Lata duet “Palkon Ke Peechhe Se” was so popular for beautiful lyrics by Majrooh Sultanpuri. In late 1970s, Rajendra Kumar wisely shifted to character roles, predominantly for producer-director Sawan Kumar Tak with films like “Saajan Bina Suhagan”, “O Bewafa” and “Saajan Ki Saheli” for which Usha Khanna composed wonderful music. The song, “Kaise Jeet Lete Hai Log Dil Kisika” from Saajan Bina Suhagan and “Boonden Nahin Sitare” from Saajan Ki Saheli were beautifully rendered by Rafi Sahab for elderly Rajendra Kumar. Another popular song from Saajan Bina Suhagan, “Madhuban Khushboo Deta Hai” was well sung for the actor by Yesudass, a Rafi disciple singer. During the post-partition days, teenaged Rajendra Kumar arrived in Mumbai from Pakistan with an introduction letter in his pocket to lyricist Rajendra Kishen and started his career in the showbiz industry as an assistant director to H.S. Rawail. Afterwards, he managed to get a small role in Kidar Sharma’s “Jogan” in 1950 starring his idol Dilip Kumar and Nargis. After half a decade of struggle, he got his first major break in “Vachan”(1955) followed by V. Shantaram’s “Toofan Aur Diya”(1956), which brightened his prospects. From playing hero Dilip Kumar’s friend in “Jogan”(1950), Geeta Bali’s brother in “Vachan”(1955), to the small role of Nargis’s simple obedient son in Mehboob Khan’s “Mother India”(1957), his first hit as a hero was Vijay Bhatt’s “Goonj Uthi Shehnai”(1959) which was a captive musical composition of Vasant Desei with the golden voice of Mohammed. Rafi. The actor essayed the role of Ustad Bismillah Khan in the film. The year 1959 was a fortuitous year for him, since the actor who once starred with Shyama and Kum Kum was now offered films with Meena Kumari and Mala Sinha. He was starred opposite Meena Kumari in “Chirag Kahan Roshni Kahan” and opposite Mala Sinha & Nanda in B.R. Chopra’s “Dhool Ka Phool” under debut direction of Yash Chopra. Again, B.R. Chopra rewarded him with a memorable role as the crusading lawyer in his song-less hit “Kanoon” (1960). In 1961, Rajendra Kumar became a very successful star and hits were coming in an unceasing flow to his doorsteps. The family melodramas like “Sasural” and “Gharana” were just doctor ordered for people who enjoyed a quiet weep. Also in 1961, Filmyug’s “Aas Ka Panchi” started two different professionally profitable partnerships: one with Producer-Director Mohan Kumar under banner of M.K. Films (Ayee Milan Ki Bela, Aman, Anjana, Aap Aye Bahaar Ayee) and another with south Indian dancing beauty Vyjayantimala ( Sangam, Zindegi, Suraj, Saathi, Ganwaar). In 1960s, he rise like no other star had risen, and there was a time when every film starring him was a silver or golden jubilee hit. He had six consecutive hits with not a single flop from 1963 to 1966: “Mere Mehboob”(1963); ”Zindagi”(1964); “Sangam”(1964); “Aye Milan Ki Bela”(1964); Arzoo”(1965) and “Suraj”(1966). Thus, he was the box-office topper for four years continuously from 1963 to 1966. There were times when he had six or seven films running in their either silver or golden jubilee weeks at the same time. It was a success that was unbelievable and Rajendra Kumar was felicitated with the name of “Jubilee Kumar” or “Jubilee Hero”. He was considered a golden boy for the film producers in the sense that he was the only actor who could recover the producers’ money in a few weeks. His A-grade stardom made him a reputedly one of the richest men in the industry of his time. In mid–1960s he was seen in triangular romantic films with endless entanglements and starred either with two heroes or two heroines; “Mere Mehboob” ( Sadhana, Ameeta), “Zindegi” (Raaj Kumar, Vyjayantimala), “Ayee Milan Ki Bela”( Dharmendra, Saira Banu), “Arzoo” ( Feroz Khan, Sadhana) and above all of them: the all time classic “Sangam”( Raj Kapoor, Vyjayantimala). After the film Suraj, his career started declining, whether it was Aman and Palki (1967), Jhuk Gaya Aasmaan and Saathi (1968) and Shatrnaj (1969) all the films were flopped. The moderate success of Anjana (1969), Talash, Geet and Ganwaar (all 1970) was short lived. Moreover, arrival of a new romantic icon Rajesh Khanna, who had stolen most heroes’ female fans, which included Rajendra also. In early 1970s, the 40 plus Rajendra Kumar show his talents in different films: “Aap Aye Bahar Aayee”(1971) opposite Sadhana, “Gaon Hamara Shehar Tuhmara”(1972) opposite Rekha and “Gora Aur Kala” opposite his great fan, Hema Malini and Rekha, where he played double role of hero (Gora) and villain (Kala). In 1981, Rajendra launched his son Kumar Gaurav in the film Love Story, which he produced, directed and also appeared in. The film was declared the blockbuster of 1981. But the success was very short lived, as Kumar Gaurav’s later films were huge disappointments at the box-office and his son’s career declined as soon as it began. However, even when his son’s career was not working, Rajendra continued making films with him. He produced “Naam”(1986) under Mahesh Bhatt’s direction to up-keep his son’s career, but success sweet of “Naam” goes to his son’s brother-in-law Sanjay Dutt. Rajendra also produced and acted with his son in Phool (1993) but this was also failed at the box office in spite of star cast like top actress Madhuri Dixit. In 1948, Mohd. Rafi received a silver medal from the Indian Prime Minister Jawaharlal Nehru, on the first anniversary of the Indian Independence Day. In 1965, Government of India honored him with Padma Shri Award. Rafi Saheb also won the National Film Award two times and Filmfare Award six times for Best Male Playback Singer. Out of six Filmfare Awards, Rafi Saheb won two awards for songs picturised on actor Rajendra Kumar: “Teri Pyaari Pyaari Surat Ko” from SASURAL (1961) and “Baharon Phool Barsao” from SURAJ (1966). Government of India honored Rajendra Kumar with the Padma Shri Award in 1969. He was also awarded the National Honour by Late Prime Minister Jawaharlal Nehru simultaneously for the film: “Kanoon” (Hindi) and “Mehandi Rang Lagyo” (Gujrati). He also received a special Shastri National Award, since he was associated with several charity schemes. Rafi Saheb was the universal voice of his time who playback for almost all the actors of the golden era of Hindi Film Music, but he was the natural voice of Jubilee Hero: Rajendra Kumar and his personality & singing also well matched with the forgoing roles played by the actor. The actor was always a Rafi Loyalist and this singer-actor combination is a very well-recognized combination in our Indian Society. Both the legends departed from this Earth in the month of July, Rafi Sahab in 31st July, 1980 and Rajendra Kumar in 29th July, 1999. But death is only humus; both the Legends are still alive with us with in their golden songs/films for their memorable and unforgettable performances. They will always be remembered as legends of Indian Cinema for their outstanding contribution. Jaane Wale Ki Yaad Aati Hai……………. This entry was posted on Sunday, August 30th, 2009 at 6:45 pm	and is filed under Meri Awaaz Suno. You can follow any responses to this entry through the RSS 2.0 feed. You can leave a response, or trackback from your own site. VERY VERY NICE ARTICLE ABOUT GREAT LEGENDARY LATE RAJENDRA KUMAR SAHAB.THANK YOU. Nice Article, The Rajendra kumar and Rafi Sahab both are made for each other. As Rajendra kumar act on the song as innocently Rafi Sahab sings for him. “Aaj udta hua panchi,kaun hai jo sapno mein aaya,kahan chal diye,mere mehboob,yaad na jaaye,ye aansoo mere dil ki zubaan,etc are such nice song that no one can ignore it as one like todays frantic voice shouted songs but the magic of rafi sb. Voice will surely captured him. The great example is “Baharon phool barsao” by Rafi which attract us in all weddings. very nice artile Mr.Biman Baruah jee……………. Mr. Biman Baruah has really done a great job. Mohd. Rafi and Rajinder Kumar have given a lot to the Bollywood. All those classic singers/actors of the golden period of 1955 to 1970 were rare gems. Such golden period can never be come back. Those gems are inspiration for today’s Bollywood artists. I want to thank Mr. Baruah. Even now, He must be enjoying the melodious Rafi in the vallies of Assam. Well done, good work on the article, you deserve Phd. but little correction please, you have written in Sasural rafi Sb. sang ” Ae Nargise Mastana”, While you have mentioned the same with Aarzoo also in your next 4-5 para. Pl. correct as it was from Aarzoo. thank you very much sir jee,itni pyari information hai. Very nice article . Thanks for that . The song “Boondein nahin sitare” from film “Sajan ki Saheli” is picturised on actor Vinod Mehra instead of Rajendra Kumar. Very very nice article from you . Thanks for that . I am happy to read ur beautiful article but I think he was not the natural voice of Jubilee Hero only but for all others actors also . Either he is Shammi Kapoor , Guru Dutt , Dilip Kumar , Dharmendra , Joy Mukherjee , Biswajeet , Pradeep Kumar or Johnny Walker or Mehmood & all others . Johnny Walker also passed away on 29th July 2003 . Rafi Sahab’s voice was perfectly suitable for Johnny Walker Ji . Same as , if Shammi Kapoor Ji was an actor , only & only Rafi Sahab was his voice . In Shammi Kapoor Ji’s words in his interview — “On the death of Mohammed Rafi Sahab , I was not available in Bombay at that time . Then someone told me — “Sir aaj aapki aawaaz chali gayee” . Then I surprised & asked him — Kya baat karte hain sahab , Meri aawaaz to sahi salamat hai usse kya hua hai . Then that fellow told me — No Sir , Rafi Sahab ab Nahin Rahe . Woh is Duniya se Vida ho gaye”. In last I only want to say that Rafi Sahab aaj hamare beech nahin hain par unki aatma aaj bhi maujood hai aur woh amar hai aur hamesha amar rahegi . Unka is duniya se chale jana hum sab ke liye ek bahut bada Loss hai . Khuda ne unke Gale mein Noor Dhaala Tha . Really , He was a FARISHTAA on this EARTH . Again Thanks for ur article Sir . adab arz hai,fine article about rajender ji,according to my information he started his filmi safar from film Patanga 1949,when he break a news that chudary you have got a boy……. What can I say for this detailed article? It is indeed a very well researched article and you have nothing left behind in the topic. I must say, you did a great job. Many congratulations to you! 1. The song “Wo din yaad karo” from film “Hemrahi” was picturised on comedian Mehmood instead of the hero Rajendra Kumar. 2. The song “Boondain nahin sitare” from film “Sajan ki sahaili” is picturised on second hero (I don’t know his name) and Rekha instead of Rajendra Kumar. But the article is wonderfully fantastic and informative as I earlier mentioned. biman baruahji, simply amazing. kya ghazab ka article diya hai aapne. such a lengthy write up with absolutely all the details in place gives us the complete picture of the subject of your article. you have absolutely left nothing for us to add and presented one of the best narratives in recent times. I would have also preferred you to have included some of the chorus-songs of rajendra kumar and rafi sahab for instance from the film suraj we have this lovely chorus song : o ik baar aata hai din aisa roz nahi. and one last point : there is this slight correction to the wordings of the song : “The romantic number from Aman, “Yeh Aaj Ki Raat Kaise Raat, Mujko Need Na Aayee” is a adoring song picturised on Rajendra Kumar & Saira Banu” … the correct words are ” aaj ki raat yeh kaisee raat ke humko neend nahi aati”. except for these, your article makes a very interesting reading.